There’s a whole raft of techniques to master in this mammoth metal monster. Take your time and your patience will be rewarded. John’s present band is a lot rockier then previous incarnations so, as the song’s in D minor, we decided to use a drop D tuning to make it a little heavier and to give something to hit when between sections. The intro is pretty much the same as the original one, but don’t worry about all the time signature changes. I didn’t realise how awkward it is until I had to write it out, so you’ll probably find it a lot easier to just listen to it a few times. From bar 15 there’s a neat little pattern of ascending fifths. As there are some spaces in between I used the low D to accentuate the ‘straight-eighths’ feel. From bar 23 of Sole Survivor there’s a nice little arpeggio section. There’s something similar on the original but I changed one or two notes and gave it a more sustained quality (and ditched the wah wah). Try a down-stroke and two up-strokes for each three-note arpeggio. For the verse I used chordal accents and a slightly muted bass figure throughout. The open fourth siring was used for the D5 chords in the verse rather than the low D string because I wanted to save that fatter sound for the chorus. In the chorus I played a figure similar to the keyboard part and kept the low D chug going. At the time I didn’t want to play anything that was too complicated because I have to sing the high harmony at the same time! At the end of the chorus of Sole Survivor (bars 58-62) on the original there are some more three-note arpeggios. I kept this idea but extended the arps because I liked the sound of them. Again, I used sweep-picking to execute the lines. At the end of the second chorus there’s a one-bar break (in 7/4) thrown in. I played something rhythmic in this part using open strings in G Mixolydian (sort of country-metal!) to help everyone finish at the same time. The melody is very strong in the breakdown so (apart from changing parts to a different octave) I kept it pretty similar and added some tapped harmonics for embellishment (bars 98 and 99) and some chord clusters at the end (bars 101 and 102). For the tapped harmonics make sure that you strike the string directly onto the fret wire exactly 12 frets above the fretted notes. When I’m playing runs, the most essential thing for me is the timing. I would rather leave out or add notes than not land on the intended beat. Therefore, some of the runs in bars 104 and 105 have extra notes contained within them so that I land on the last note (the important one) at the required juncture. I generally use economy picking if I want a smooth-sounding run like this. A lot of guitar terms explained in our Jargon Buster. There’s a place in bar 114 where I put my hand over the top of the neck, hit the strings fast and move my hand up. This is obviously a ‘show’ thing as it sounds the same if your hand is coming from underneath the neck. Anybody who has seen me play knows that I enjoy the ‘show’ aspect, so there’s a lot of this type of thing going on during a gig. In verse three I added a few bits such as doubling the keyboard phrase in bars 127 and 128.I also added a two-octave G minor arpeggio in bar 131. From bar 151 we’re into the guitar solo. The solo of Sole Survivor starts with a minor third bend on the B string – it’s nice to have something that just comes in and grabs people’s attention. Things are almost tasteful until bar 159, where there’s a bit of a monster lick. As you can tell most of it is played legato with some tapped slides on top. These are pretty easy as long as you don’t press down too hard. In bars 162-163 I did some more tapped stuff, but this time with slides using my left hand. I can’t honestly say whether these are difficult or not because it feels very natural for me to do this kind of thing. There’s an ascending octave line in bar 165 and things get pretty funky for a couple of bars before the mad sweep/tapped section in bars 169-171. These are just a bunch of Csus2, Dsus2 and Fsus2 arpeggios but they sound quite effective. In bar 173 I use a three-note-per-string D minor pentatonic shape with the left hand and lots more taps with the right followed by an intervallic string-skipping thing in bar 174. Bar 177 contains a Greg Howe-style legato lick and there’s a mad alternate picking thing in the last bar (181) of the solo using groups of nine to finish things off. Then we’re into the last chorus of Sole Survivor with some bizarre sound effects using the tongue (yes, I’m serious) to produce some neat harmonic runs. Again, these can be produced using the side of the hand, but the tongue looks so much funkier! Check out the original version (with Steve Howe) on the first Asia album, various live Asia recordings with Pat Thrall or listen to the live John Wetton album Nomanshnd, from which this version is taken. 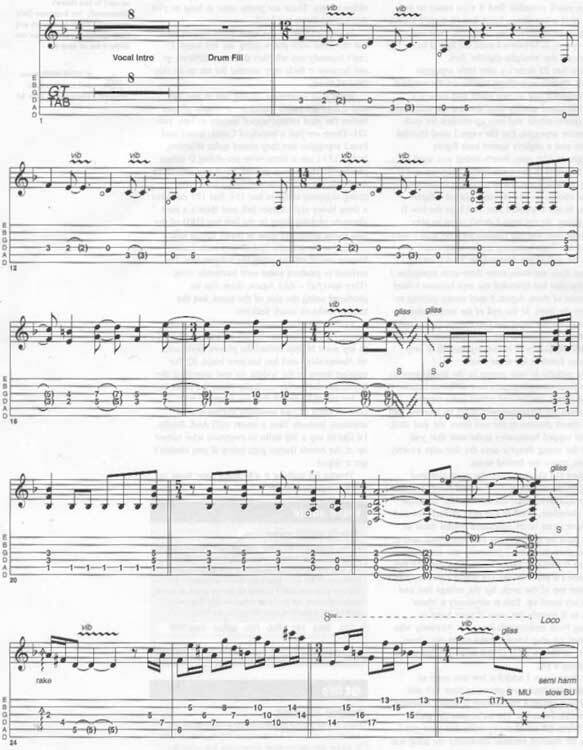 It’s just a part of Asia Sole Survivor guitar tab and music sheet. © 2012 - 2019 TabsClub Powered by TabsClub 42 queries in 0.287 seconds.